Ugh, love songs are so sappy, right? Usually! But every once in a while there's a glorious exception. Something full-to-bursting with a vital vibrancy. Something earnest and cute without being lame. Dear and the Headlights' "I Just Do" is one of those songs. 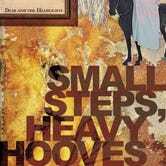 Off the band's fantastic 2007 debut Small Steps, Heavy Hooves, "I Just Do" is an up-tempo indie folk jam with a lyrical focus on the little things, the wonderful things. The sonic equivalent of that flutter you got in your chest when s/he looked at you, smiling, across ice cream sundaes at the Friendly's your parents drove you to when you were in 8th grade.